What do you have to do to be called a terrorist? This question comes to mind when the word ‘militant’ is used in almost all of the media accounts of the Mumbai attacks. In addition to the usual targets of Westerners and Jews, the gunmen murdered anyone available — old men and women, anybody they felt like shooting. When terrorists detonate a bomb, they know they are going to kill indiscriminately, but they don’t usually look their victims in the eye. In many cases these terrorists carefully aimed at their victims, most of whom were ordinary Indians. “One man’s terrorist is another’s freedom fighter”, Jeremy Bowen of the BBC famously said, no doubt having in mind Palestinian terrorists and thereby proving himself a moral idiot. I suppose his logic is that he would prefer not to offend anyone, no matter how ignorant that person may be. But for whom are the Mumbai terrorists ‘freedom fighters’? Is it necessary to call them ‘militants’ so as not to offend the homicidal sociopaths among The Times’ readership? How many of them could there be? The media coverage of the Palestinians seems to be based on the idea that nothing can possibly be their own fault. Every problem they have is a direct result of Zionist colonialism. That’s nonsense. But every story like this buttresses the position of those who want to solve all the problems by making the Zionists go away. I realized something important when reading a relatively marginal feature story from the Associated Press. It shows us that Palestinians don’t really exist as a society but only as a set of victims. By definition, all — or to be fair, almost all, of their problems are said to come from Israel. Yet since the continuation of the conflict and their difficult situation comes first and foremost from within Palestinian politics and society, this kind of interpretation makes it impossible to understand why there is no peace, no Palestinian state, and no end of violence. Note that the mere existence of Israeli installations nearby is the “terrible” thing that allegedly cancels out this individual’s Garden of Eden. Not that there is any direct effect, but the message is that all Palestinians are a subject people, no matter how rich they are. He may never meet an Israeli, he may live in a situation where he can accumulate wealth and act as a lord, he may live under Palestinian Authority rule but — we are told — this is deceptive. Because nothing matters but Israel’s presence, even if it is barely in sight. I have learned not to take even the most basic claims of AP for granted so I do not assume that there are “army bases” or settlements in the area. Jarring? How about asking the most basic questions, the kind that would be asked in covering any other society on earth? We are not told from whence this monopoly came — from the PA. The word corruption is never mentioned. Such a lack of curiosity about the sources of his wealth does not accord with journalistic practices in covering other stories. Indeed, the story of the telecommunications monopoly is one of the best-known stories of corruption among Palestinians. How PA and Fatah factions competed over the loot, how Arafat intervened directly into the issue. The Palestinian upper economic and political class cares nothing for its own people. In its fourteen-year rule of the West Bank, the PA has focused on looting it rather than on raising living standards and providing good government. Billions of dollars in international aid donations have disappeared, probably paying for a large portion of Masri’s mansion. The PA’s failures are blamed on Israel both by the PA itself, Western governments, and the international media. Palestinian suffering is not primarily due to Israel but to their own leaders. A lot of Israel’s success has been due to Jews around the world making both investments and donations. Palestinians have not been forthcoming in supporting their own “state,” a point well-known in Palestinian circles (an exception here, of course, is in backing Hamas’s terrorist campaign in recent years). Anyone who keeps their eyes open will see other huge, albeit less impressive than this one, mansions in the Gaza Strip and the West Bank. Even other members of Masri’s own family have been criticized for their ostentation. While this estate may be the most extreme case, it is hardly an exception in that regard. Wealthy Palestinians do not give charity to help their poorer cousins. The PA doesn’t even have a comprehensive tax system. Thus, the international community is left to support the Palestinians, and their oversized security apparatus. Violence sponsored by the PA was responsible for destroying the chance for their people to work in Israel, hitherto a major aid to their economy; the destruction of infrastructure; and the hesitation of investors, who are also put off by the PA’s corruption and incompetence. Intransigence and the failure to reach a compromise solution stem from the Palestinian leadership, including Masri’s buddy, Arafat. Meanwhile, despite the hints in this article about a stifling Israeli occupation, Masri has no difficulty in proposing huge projects costing more than a half billion dollars. I suspect that these projects will never materialize but will be scams for ripping off foreign aid money. “Masri remains optimistic, even though independence appears no closer than when he first returned to the West Bank.” Hm, I wonder why they haven’t achieved it yet. I sure won’t learn it from AP coverage. And to switch to the broader picture, consider another Karin Laub effort, “Abbas ads make appeal to Israelis,” November 21, 2008. The subtitle is, “The Palestinian’s ads detail withdrawal terms first offered in a 2002 Arab Peace Initiative.” Well, if the ads detail the terms, Laub certainly doesn’t. Of course, Israel has already withdrawn from all of Gaza, but at any rate it would have been easy for Laub to mention that the terms are for Israel to leave all of the West Bank and all of east Jerusalem, not one centimeter less. She merely had to insert the word “all.” The point is that the way it is worded makes the offer seem more attractive than it is. But that’s not the worst part. Laub doesn’t mention that the plan also demands that all — there’s that word again — Palestinians who ever lived in any part of what is now Israel and all their descendents must be allowed to ‘return’ to Israel. That’s a few million people. To distort points of fact about the terms is scandalous and shameful. A couple of decades ago, AP would have issued a correction. But that’s not the way things are done nowadays, is it? Foreign Minister Tzipi Livni is only paraphrased as saying “its positions on key issues such as final borders, the status of Jerusalem and the fate of Palestinian refugees are not acceptable.” There’s no explanation as to why it is, presumably lest Israel’s rejection be understood as a rational response. And as always there is no mention of Palestinian refusal to meet Israel’s needs. As always, we aren’t even told about such things, which Abbas’s adds don’t mention: end of incitement to terrorism, a declared end to the conflict, no foreign troops on Palestinian soil. One might think that an ad campaign by the PA would say something about Palestinian positions. Of course, that’s in the last paragraph. But two more reasons for Israeli skepticism should also be added: the failure of the PA to keep its past promises and its demands that Israel give everything without offering anything itself. Can we coin a phrase here? Much of the coverage can be called “anti-news” because it is deceptive nature. Perhaps there should be little labels affixed, like those on cigarette packs: Warning! Reading this article can be hazardous to your intellectual health. As I write, news reports indicate that hundreds are dead and injured in Mumbai. 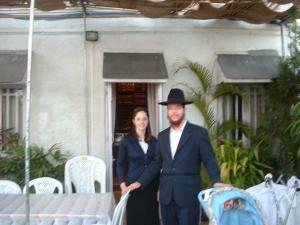 Indian commandos are about to storm the Chabad house there, where it appears that Rabbi Gavriel Holtzberg, his wife Rivka and an uncertain number of others are being held hostage by terrorists (their small son was reportedly rescued early on). It’s painful but impossible to stop trying to keep up with events as this horrible but familiar story unfolds. I’m sure when it’s over the ‘mujahideen’ that perpetrated this atrocity will explain that they had important ‘political’ motives. What political imperative made them include the Chabad house as a target? Is Chabad someow a representative of the Zionist entity that is denying ‘human rights’ to Palestinians, who are themselves no strangers to this kind of ‘political’ activity? No, let’s face it, we know why the Chabad house was attacked. It would be good if the various camps among Israelis and Jews everywhere would pay attention and understand that after all this time they are not a ‘normal’ people in the eyes of the world. This is why there needs to be a state of Israel that can defend itself and indeed, defend the Jewish people. Israel’s attorney General, Menachem Mazuz, has informed Prime Minister Olmert that he will likely be indicted for systematically billing multiple agencies to pay for private trips abroad (Ha’aretz, AG plans to indict Olmert over double-billing affair). This would be the first time a sitting Israeli PM was indicted. There is no law in Israel which demands that the PM resign if he is merely indicted for a serious crime (he would need to be convicted), although Olmert has said that he would step aside if indicted. If he does resign or declare himself incapacitated, the ‘designated acting PM’ is Foreign Minister Tzipi Livni, and she would take the position of PM for up to 100 days. New elections are already scheduled for February. Polls show that the coming election may be close, although the Likud party of Binyamin Netanyahu presently has the advantage. That could change, and there is also the possibility of a unity government. In any event, there’s no question that Tzipi Livni today would be much more effective as PM than Olmert, the lamest of ducks. There have been suggestions that the Obama administration wants to get moving immediately after his inauguration on a far-reaching ‘peace’ plan. Olmert has already made inappropriate statements about what Israel should be prepared to accept in negotiations with the Palestinians, statements which will be construed as bottom lines when serious negotiations resume with the new administration. Considerations of national interest as well as decency and self-respect demand that Olmert step down now.